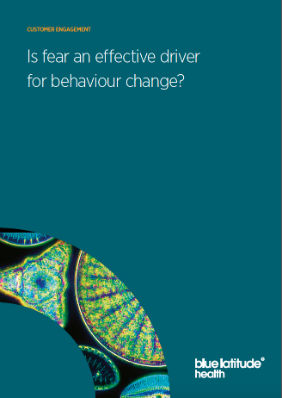 Since the mid-1950s, fear appeals have been applied in an effort to reduce a number of risky, yet modifiable, health related behaviours.¹ Today, they still remain a popular technique for creative agencies, researchers, interventionists, and policy makers.² Even influential bodies such as the World Health Organisation argue in favour of one of the best-illustrated examples of fear appeals; the health warnings on cigarette packages.³ However, if you ask a smoker about the warnings, you’ll often hear “I just ignore the warnings”, or “that’s not me so why would it affect me”. So, can fear really motivate someone to change their behavior? Can it make a healthcare professional (HCP) choose one treatment over the other? Can it make a patient more adherent to their treatment or encourage them to exercise more, or change their diet? Can it make an HCP prescribe a treatment sooner rather than later? Despite caution from some researchers, Client Lead Natalie Seebeck explains that applying fear-based models, specifically Protection Motivation Theory (PMT) and the Extended Parallel Processing Model (EPPM), in communications can be effective, if the right components are used in the right way. What is a ‘fear appeal’, and how does it work? Once these are presented, an individual’s evaluation or appraisal of these components is expected to result in a motivation to change behaviour. A threat appraisal is the process whereby an individual compares the perceived severity of a threat and their personal likelihood of the worst case outcome, against the potential rewards of engaging in the risky behaviour. Liz, who knows she has a high risk for skin cancer due to family history and skin type, will be more likely to apply sun cream (provided it is easy for them to access, and relatively cheap to purchase). Leo, who knows he has a lower risk of skin cancer, or for whom the cost or convenience of applying sun cream is much higher, will probably forego it.